The Widnes Wild women’s team picked up a well-deserved point against league leaders Swindon Topcats in an entertaining and highly competitive 3-3 draw at Silver Blades Widnes on Saturday. The table topping Topcats arrived on Merseyside with an unbeaten record so far this season – having only dropped one point in their 8 games – in a 2-2 draw away at Nottingham Vipers. The Wild women took the game to the visitors from the off but, once again, it was the away side who found the back of the net first – with the opening goal from Topcats’ top scorer Rebecca Da Cova (assist Rebecca Inker) coming after just 2.43 of the match. Widnes outshot Swindon 11 to 8 in the first period but it was another 10 minutes before former Belgian international Leen De Decker scored the equaliser for the Wild (12.46 - unassisted). The score remained the same at the end of the first period. The match was finely poised and, with the confident way that the Wild women were playing, an upset was possibly on the cards. The Wild women took the lead right at the start of the second period with an excellent strike from Abigail Culshaw (20.54 - asst Catherine Bowen Fell) scoring her first goal for Widnes. The lead lasted less than 3 minutes as Captain Rebecca Inker pulled the Topcats back level on 23.43 with an unassisted goal and then Swindon retook the lead on the halfway mark with a goal from player coach Rebecca Osman (30.41 – assts Sarah-Jane Fletcher & Rebecca Da Cova). To their credit, however, the Widnes women dug deep and that was the last time that the visitors hit the back of the net. The final period was extremely close and you couldn’t get a proverbial cigarette paper between the two teams. Then Abigail Culshaw broke through and lifted the puck over the Topcats’ netminder to put Widnes back on level terms. Neither team sat back settling for the draw and both teams had countless chances to win the game. A slashing call on Widnes’ Abigail Hayes in the dying minutes kept hearts in mouths and the Wild on the back foot as they managed to keep the Topcats out shorthanded for almost two minutes and claim a well-earned point. 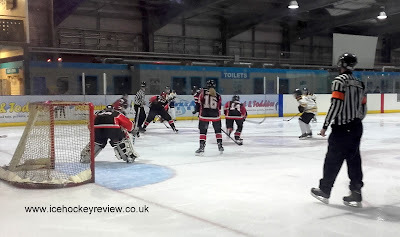 The result means that the Widnes Wild women’s team closes up to within 2 points of Slough Phantoms who are in 4th place but have played 3 games more. They are away at second from bottom Chelmsford Cobras next Sunday – 3rd April – and then at home to the same opposition on Sunday 10th April in a 7.30pm face off.